Hello there, my next few posts are all pre-scheduled for posting as I am going to be offline for a couple of weeks or so, hopefully you are reading this and Mr Blogger has worked properly, I'm actually here on Sunday afternoon in some gorgeous sunshine writing all my various posts up ready to go. This is my first DT card with Delightful Challenges. it's for their latest challenge beginning today entitled "Use your Scraps", I've used the very cute Pippin Mouse image in my card, now obviously they prefer that you use one of their fabulous Digital Delights images in your creation, but you do not have to in order to play, if you do you will receive two entries. So what are you waiting for. Wow! I love this! Great job! Thanks for sharing with us at Going Grey with Scrap-Creations. So darling! Thanks for joining us at Paper Romance! Gorgeous Wendy! You've done it again! Another jaw-dropping piece of art! Gorgeous card - love it! Beautiful image, lovely coloring and I just love the whole thing! Thanks for joining us at Do You Stack Up. I love your card. It's so pretty. Thanx so much for joining us this week at Incy Wincy. Hope to see you back again soon. Darling card, Wendy! Love the different shape. Makes it fun! Great use of scraps. Your card is simply delightful! Thanks for playing in our challenge at Operation Write Home! What a cute card! Don't you just love Birthday Pippin! Great sentiment too! Thank you for sharing! 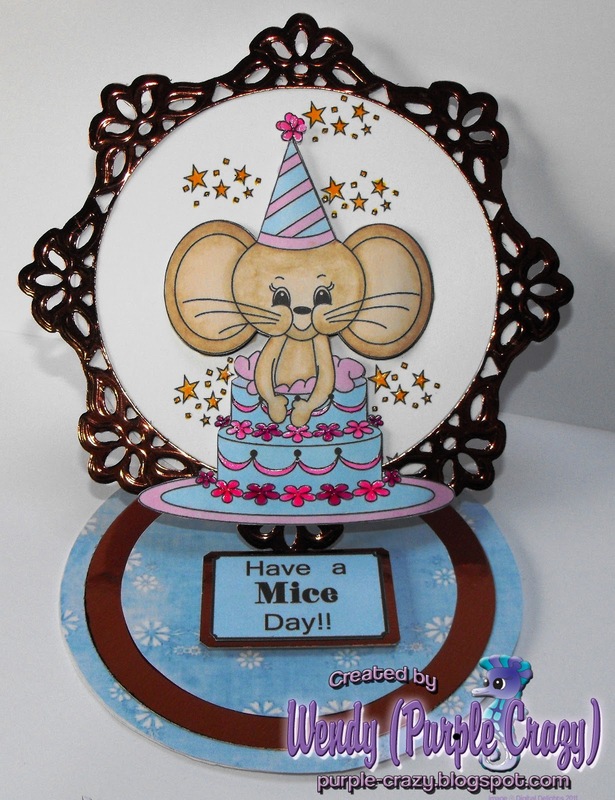 Adorable card....and love your coloring. Thank you for playing along in the Paper Romance challenge this week. Fabulous card! What a cute image and I love how you've framed it with the beautiful doily matte behind it. Very sweet. Thanks for joining us at PTT. Hope to see you again soon. Thank you so much for playing with us at OSAAT. 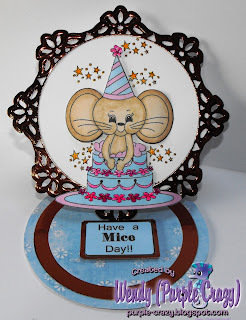 Such a cute easel card Wendy, love the shape. Thanks for joining us this week at OSAAT. Oh my gosh, how sweet! thanks for playing along with SSD!